I have a fully cut, partially arranged and partially sewn, grandson six point star quilt on my wall. It was actually one of my UFO challenge quilts, but impatience got in the way, and I simply couldn't wait to work on it. There will certainly be more for him than just this one. It has used some of the fabrics that have come into the house this year, but only a strip or 2 from each one. The pieces are cut small, so the individual prints don't show up very much, but emphasize the colour contrast instead. I think I will do something like a Yellow Brick Road style quilt that will have pieces big enough to showcase some of the really cute fabrics. But, I like the colour play in this arrangement. I have to work this afternoon, but am hoping to get a row or 2 sewn before I go. It was a rough weekend at work, so I don't have a lot of energy to spare for much else. This is the first Monday in a long time that I've had to work. But, there are so few hours availabe, that I have to take what I can get, and am grateful to God for them. Go on over to Patchwork Times to see more wonderful and inspiring design walls. Go on over to Patchwork Times to see how others are doing with their stash busting. I'm participating in a UFO challenge through Patchwork times I went through some of my UFO's back in December, and numbered them 1 to 12. 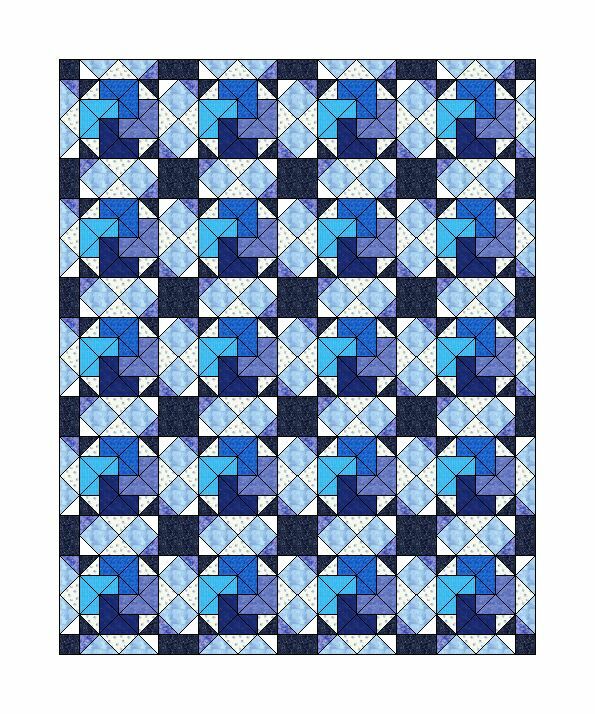 Judy picked #6 for January, which was this Card Trick quilt. At the beginning of January, all it had was 12 card trick blocks. Last night, I put the last stitch into the binding, and so can cross this off my list, and call it finish #2 for the year. Yippee, woohoo, and happy dance! I quilted it with an allover pattern called Fay Feathers, I'm not sure, off the top of my head, the name of the designer of that pantograph. I used a variegated medium blue Rainbows thread. The quilting doesn't show on the full picture, but it does on the smaller pic below this one. And then there is a pic of the backing, which took 6 of those yards that I've bought this year. I've finished my squares for this week. Woohoo! Not only that, but I have one of next week's all cut out, and ready to sew, probably today before heading in to work. So, squares # 21 and #22 are done, I need 2 more, and then, after I do all the machine applique stitching (groan), I can start putting the first of the quilts made from these squares together. Originally, I was going to substitute a large motif from a fabric for the Sweet Dreams embroidery, but them I remembered that I had bought a permanent fabric marker, in red, for doing faux red work embroidery. So, I used that. It took all of 10 minutes, and I think it turned out quite well. Hopefully, though, permanent really means permanent. Ah, Monday morning, when all is quiet. A good cup of coffee, and all kinds of design walls and quilts to look at, over at Patchwork Times while my brain clears enough to be able to think coherently. The second coffee, sitting here beside me should help. Unfortunately, I have sleep issues, and need to take medication to help it, which causes brain fog in the morning. So, it takes a while to get the engines running. But they are going now. On my wall today, and for the next few days, is the partially finished design for the setting for the 100 block challenge I need 4 more blocks before I can start putting it together. I think it needs some more blocks that have a dark background to them, rather that the beiges or creams, so I can now plan the fabric choices of the next few accordingly. So, that is part of my plan for today, to get at least 2 more blocks done for this quilt, and maybe even more. Past that point, I haven't quite decided what I want to do, but at the moment, I'm leaning towards working on a baby quilt, based on hexagon stars, inspired by this one I have all those fun baby fabrics up there calling my name, plus there are more coming in the mail, hopefully sometime this week. Added to that, I'm going to keep on with doing 2 of the string units for RRCB, and at least 2 lengths of thread on the binding for the Card trick quilt, so that I can count it as finish #2 for the year, and as a finish for the UFO challenge for January. Last July, I started a participation in a quilt-along with Teaquilts who started a blog at the linked address I've just given, to record our progress. There were 3 of us participating. It was fun to be able to watch the other 2 quilts come together, and see the difference that fabric choices make to the look of a quilt. Last night, while watching "Pillars of the Earth", I put the final stitches into the binding, which allows me to call this my first finish of 2011. Woohoo!!! And, I love it. It was nice to begin with, but the Baptist fans, and the navy quilting thread have transformed it into a truly lovely quilt. In addition to the 2 blocks for the 100 block challenge, I managed to finish almost everything on my list from yesterday, except for the machine work on the fusible appliques, and the prepping of the applique shapes for the My Tweets, but those I can do before I go to work tomorrow. But, I have a good excuse. Hy dear husband came home with the "Pillars of the Earth" series. So, we've been watching it for most of the evening. And, while watching it, I've actually finished the binding on the Nine Patch Pineapple quilt, to give me my first full finish of the year. And then, I've got one side of the Card Trick stitched down. Woohoo!! I promised pictures of the three wall hangings, and the fishies. There isn't a lot of quilting detail to show on the wall hangings, since they were very simply quilted around the shapes of the applique, and in the ditch arounf the borders. But, they sure are cute. I'll put up a pic of the finished Pineapple NIne Patch tomorrow. So far today, a lot has been crossed off that list I made yesterday. Here are the next 2 100 block challenge squares. Instead of a snow house, I dug up some old landscape quilt fabrics I had from quite a few years ago, and made an English thatched cottage instead. The other square was named "Versailles" Just 4 more squares, and I can put together the first of the quilts made from them. The cottage square is fusible appliqued. I forgot to reverse the pattern when tracing it, so it came out reversed from the pattern, but it still looks fine, although, looking at the picture, the greens in the trees could have stood to have a bit more contrast. In the Versailles block, I didn't like the placement if the darks and lights, so I switched them a bit in the star points, so that they are in the same spot in each corner. I like the movement it has this way. Start Amalia's 3rd wall hanging......... half done There are 5 in total. Do up some ideas for the layout of the "Here Fishy, Fishy" quilt for the grandbaby...... not done, add to tomorrow. The reason for these lists is that, since finishing up the quilting on Card Trick on Monday, I've been floundering around, unable to figure out what I want to do, therefore not getting a whole lot of anything done. Plus, I want to give myself some push to just do little bits of the things I don't like to do, like hand sewing the bindings to the backs of the quilts. I figure if I write them down, as a reminder to myself, it will put the idea into my brain, and not get pushed to the background. Today is my second day of doing this, and it seems to be working. Play with EQ5 for "Here, Fishy Fishy"
Finish Amalia's 3rd wall hanging. method of a small pair of scissors, and a roll of duct tape, to pick up the strays. I used it while I was quilting Card Trick, and the picture below shows the stuff that came off it. All neatly contained in the catch container, rather than on the quilt, or my clothes or, the usual place. the floor. Thank you, Noel and Laurie. 3-11 for so many years, that, even though I would like too, my body simply won't sleep much before 1 am, and that only accomplished with medications. So waking up the next morning is always a long process. However, I have my second cup of coffee in hand, and can now think clearly enough to put down a thought or 2. My Card Trick quilt, which was my UFO challenge #6, is now a finished top. The picture is a little too much on the grey side, but I don't know how to compensate for that. I am really happy with how this turned out. I had somehow goofed, and ended up with too many 1/4 square triangle units, so I put them on opposite corners of the border, to use them up. I was going to add another dark border to it, but when I hung it up to look at it, it told me that it was done. So, I'll use the dark blue for the binding instead, which actually will add the finishing dark border that I originally wanted, just very narrow. So, my goal for today, provided work doesn't call and offer me a shift, is to get the backing fabric out and ironed (groan), pieced, and hopefully this quilt loaded onto the machine. I think it is going to get an overall type feathery thing on it, in blue variegated thread. I've started the tropical fish wall hanging for our grandson's bedroom. I don't really know just yet how I am going to put it all together. It is going to have the blue fabric as the "water" background, and a bunch of different fish. Past that point, I'm not sure. I have all kinds of fun, bright colours to use for the fish, and I'll just have to wait and see where it takes me. But one thing is sure: it is going to be fun. Is it ever a lazy day around our house today. One of those pretty winter days that are best spent indoors. The snow is falling, but there isn't much wind, so the flakes are just kind of softly drifting down. If I were the active, outdoorsy type person, this would be a perfect day for a walk. But, I'm not, or at least not in the winter. However, It isn't supposed to be a lazy day. We have errands to run, and groceries to pick up, but I have no motivation to do anything, except stay put indoors. (sigh) But, the cupboards are close to being bare, and the refrigerator is near empty, after it's annual New Year's purging of out dated stuff. This is the first day since Christmas vacation that Scott and I have actually had a day off, so we have to get some stuff done. Oh well. I managed to get this weeks blocks for the 100 block challenge done. They are both fused to the fabric, but haven't been stitches down yet. I tend to save that step until I have a lot of it to do, since it involves messing with the tension of my machine to get the invisible thread to work properly. So, when I get enough of them, I put a movie in, usually one that I know, so that I can listen to it, and still know what is happening. I should try talking books, sometime. That would work, too. But, I've procrastinated long enough, and the grocery store is beckoning. I had to drive Scott to work this afternoon for his 3-11 shift so that I could keep the car this afternoon, since I need to pick Becca up after she gets off the bus and made the mistake of going into Len's Mills Store, looking for some kind of a star border quilting stencil. You know what's coming next, don't you? There was no star quilting stencil there, but, they were having their January clearance of fabrics, for 50% off the lowest price. So, a couple of bolts of fabric went into the cart for backings. And I found a gorgeous sunflower stripe that would make a lovely table runner.Then, I started thinking, always a dangerous thing to do in a fabric store, about the "My Tweets" BOM that I want to do this year. Each block is going to have a peacock-ish type bird in it, with fancy tail feathers, and I thought it would be fun to try and keep the body of the bird the same colour in each block, but have the tails different. So i picked up some purples, and yellows, and aquas, in different shades. Then, I did some more thinking, about a wall hanging that I'm doing for the coming grandson's bedroom, based on these fish since they are doing a tropical Hawaiian idea in his room, and so I picked up some fun fish body fabrics. I checked out of the store 21 yards richer. Such fun. Also today, I got a customer wall hanging done, and yesterday, I finished all the setting triangles for the Card Trick quilt. Woohoo! Tonight I am going to try to get the quilt all sewn together and start to think about borders. UFO #6 just might get done before the end of the month. I just looked at the design wall posts at Patchwork Times and the are already 71 different walls posted. WOW! These are really taking off this year. Tons and tons of eye candy and inspiration. What a lovely way to spend the time over a cup of coffee or 2 while my brain engines try to get into gear. I managed to get all the alternate blocks for the Card trick quilt, UFO #6 done last week, and they are on the wall .My job today, once my brain has cleared, is to figure out the math for the setting triangles. 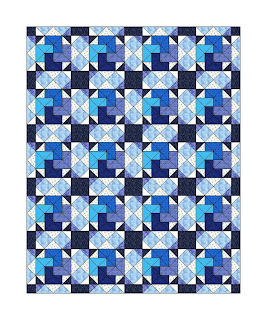 Both EQ5 and Quilt Pro programs show the setting triangles as partial blocks, and the are showing half square triangle units and quarter square triangle units made of the same fabrics. Somehow, that seems like a silly thing to do. So, I want to convert them over to squares and rectangles, which is where the math comes in. Subtract 7/8 inch from measurement given, to find finished size, then add half inch to get cut size, for the half squares. For the quarter squares, subtract 1 1/4 inch from given size to find finished size, ad then add half inch. It's one thing to know the formula, it's another to actually get it to work out. The other thing on my wall today is the setting I am planning on using for the blocks for the 100 block challenge The idea for this setting came from a book by Judy Martin called "The Block Book" I need six of these to make a twin sized quilt, before borders, so I'm over halfway there with the 12 inch blocks. The nine patches are being done as leaders and enders. Today, I hope to get my next 2 challenge blocks done, and get the setting triangles at least started. But first, another cup of coffee, and some more wall browsing. And, those added numbers are going to go way up, as I start adding in fabric for all the luscious grandson sewing I plan to do. So much fun. I was playing with some stuff for him on Friday night, and got a couple of tropical fish cut out and fused. I'm going to be doing a wall hanging for his room based on these patterns from Fat Cat Patterns Judy, over at Patchwork Times hosts a weekly stash report linky. So, if you want to see how much other people are adding and using, go on over and take a look. It is now time, since the holidays are over, to play catch up with all the customer quilts I have waiting to be done. Their owners, when they dropped them off, knew that I wouldn't be able to get to them until the New Year. So, here is finish #1, Donna's 4 patch rectangles. I love how the curvy quilting compliments the straight lines. I'm also now caught up on the blocks for the 100 block challenge . These are blocks 14, 15 and 16. I must confess that I did not like doing the curved seams of block #14, although I'm not sure why. I've done curved seams before, and they've been fine, but these didn't want to cooperate in the least. It is quite visible in the bottom right corner that there were some stretching issues going on, but, it is going to stay that way. I think if I were to do a quilt using this design, I'd skip the curved seams, and fusible applique the shapes that are the leaves fabric to the backgrounds. In the pattern for block 15 had a Christmas tree in the snow globe, but I decided I wanted something different. I had some fabric with different teddy bear motifs, and thought one of them would look good in the globe. They would make a really fun Christmas wall hanging. My plan, with all of these, is to put them all into the same sampler quilt, regardless of the theme of the blocks. I've been using the same colours in most of the blocks, or colours that are complimentary, so they should all work together, I hope. And #16, well, it was just plain fun to do. I love the different sized polka dots. I'm working on some 9 patches that are going to be part of the setting design, also in colours that will compliment the blocks, and using them as "leaders and enders". So, hopefully by the time I'm ready to put the quilt together, I'll have all the nine patch squares done that I need. And now, hi ho hi ho, it's off to work I go. Word for the year, word for life. I was surfing around blogland yesterday, and came across a number of posts talking about choosing a word for the year, to focus on, and try to incorporate into our lives. I didn't really plan on participating in it, and didn't plan on doing a post about it. But, it's been stuck in my head ever since. And the word that keeps coming to me is "trust", like the hymn that says: "Trust and obey, for there's no other way, to be happy in Jesus, but to trust and obey." I've been finding myself lately, worrying over things. So, instead of worrying, I want to trust. Trust that the Lord will supply our financial needs as the hospital closes beds, and Scott gets closer to retirement. Trust that the Lord will keep our children and soon to be grandchild safe and healthy. Trust that the Lord will give Noel the confidence he needs to know that he will be a great father. Trust that the Lord will be present and a comfort to Susan as she grieves over multiple losses this past year, and struggles with her own trust issues. 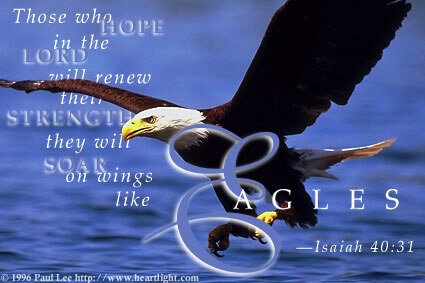 Trust that The Lord will keep my dearly loved husband healthy for many years to come. So that's the focus, the change in the way of thinking, that, instead of worrying about these things, which is as useless a thing to do as there can be in this world, to trust in our God and Creator, who is more than able to care for all our needs. I've decided to participate in the stash report, sponsored by Patchwork Times this year. Not so much because I want to use up stash without buying more, but because it will be fun, I think, to keep track of fabric coming and going. I suspect it will be mostly coming, since I'm working on a retirement savings plan.......... of fabric. Wow, January 1st, 2011. That is a total freak out kind of thing. I just got used to signing 2001! LOL. Do you remember all the fuss about that year, and the comparisons to the movie 2001? Do you remember the fuss over the year 2000, and how everything was going to come to a stop? so, how did it suddenly go from that, to 2011? The saying goes "time flies when you are having fun". Well, I must be having loads and loads of fun. (giggle). This past year was fun, starting with our daughter's wedding in June, and all the preparations that went into it. And it ended with finding out that we're going to be grandparents to a little boy, somewhere around May 22nd of this year. That's a picture of him, Done by 3D ultrasound on Dec 29. The technology absolutely blows me away! On another note, it has been a year since I started this blog. I really had no idea of what I was doing, just thought that I wanted to chronicle some of life's moments, and keep track of the various projects I was working on. I've done that, and discovered, not very surprisingly, that I start an awful lot of things, but sure don't finish very many, if finishing counts as being quilted and bound. I've finished at least 6 quilt tops this past year, but they are still waiting to be quilted. But, one of the totally unexpected things that has happened is the people that I have met through this medium. So many kind, caring, thoughtful and talented people. I have one of those "feedjit" things on my blog, that tracks who is visiting, and from where. A lot of people come from the design wall monday posts, but there are a few that show up regularly, sometimes several times a week, just for visits, I guess because they like what they read, and are curious what is going on around here. I'm not sure if this is good "blog etiquette", but one of them is someone from Engadine, New South Wales. I would love it if you would introduce yourself, and tell me a little about yourself, my curiosity is killing me! There is something intriguing about a country on the far side of the world, whose summer is during our winter, where our today is already their tomorrow. And, anyone else, who visits regularly, please introduce yourselves. I would love to "meet" you. I'm participating in the UFO Challenge sponsored by Judy over at Patchwork Times, and this morning she drew the first number of the project we are to work on, with the aim of getting it completed this month. I don't know if mine will get completed, but it will get to a stage further than it is now, which is all I'm aiming for, since there are customer quilts piling up, and grandson sewing to do as well, which should be so much fun. My number 6 project is my Card Trick swap that I did with the Canadian Quilt swappers which is a yahoo group for Canadian quilters, which helps keep it in the country, and therefore keeps postage costs down. This is the layout that I am planning on using, which I designed in The program "Quilt Pro" I am not fond of that program, but, since I have a Macbook, I can't run the Electric quilt software, which I love. This is a 2 block quilt, set on point. I really like this setting, because it makes it look like there is fancy sashing in between each block. All the card trick blocks are done, so I need to get the alternate blocks cut, and sewn. And, the bonus is, that it is a very simple block to make. Can you find it? So, that is my goal for today, before I go to work at 3. Pull the white and blue fabrics for the alternate squares and, if I can clear off the mess from my cutting board, get started on cutting the units for this quilt.